A Sunbury man is marking the 20th anniversary of Princess Diana’s death today with his own unique homage to Britain’s royals. Michael Maxwell, Big Walnut High School class of 1982, said he became interested in the British monarchy while doing a report on them for at the then-middle school. A visit to Maxwell’s house reveals a collection of royal memorabilia in the form of commemorative plates and dolls, many from the Franklin Mint and acquired through eBay. Most represent Diana, although one antique tin had a picture of Queen Elizabeth as a child. British music wafts through the home, and a Union Jack greets those who visit the self-proclaimed Anglophile. When Lady Di married Prince Charles in the summer of 1981, more than 750 million people around the world watched the ceremony, including Maxwell. Maxwell, who has retired from a career in secondary education, has been to London four times to soak up the atmosphere. England’s Rose earned Maxwell’s admiration from the start because this princess was dignified, down-t0-earth and compassionate. “She shook hands with AIDS patients without wearing gloves like everyone else did. That’s the essence of what Diana was,” Maxwell said. And although she was a trend-setter in her hair style and fashion, Maxwell pointed out that Princess Diana was a patron of over 250 organizations when she died at the age of 36. Another reason Maxwell admires Diana is the way she raised her sons, princes William and Harry. To mark the occasion, Maxwell has brought some of his collection out for prominent display, and he will fly the Queen’s Standard, which draped Diana’s coffin in 1997. “She is an international icon to this day,” Maxwell said. 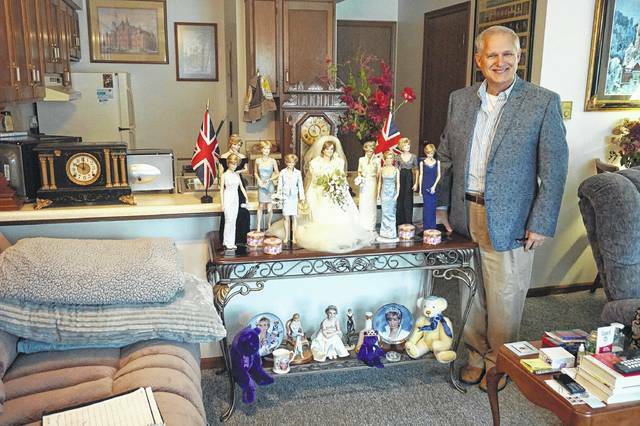 Michael Maxwell stands with some of his Princess Diana memorabilia at his Sunbury home.